Only 52 lbs. left in stock! A one of a kind coffee from Maui Hawaii! The coffee bean of the Maui Mokka is very small and round. It is often mistaken for a Peaberry. However, a closer look at the bean will reveal the classic flat side signifying two whole beans per cherry. The cup quality of the Maui Mokka is absolutely wonderful and unequaled. Known as the "champagne" of Hawaiian coffee, this is an outstanding and unique coffee offering from Maui! This is a medium bodied coffee with abundant notes of chocolate, a round, solid mouth-feel. The aroma is sweet, with mild hints of nuttiness. The acidity is on the bright side, but not overbearing, and the winy finish is rich and long. I prefer a Full City roast for this Maui Mokka to bring out the smoothness and to balance the chocolaty tones and fruity acidity. This roast level will liven up the profile by highlighting the acidity and winy notes. This is a good choice if you prefer a bright, snappy finish and want to experience pure Origin Characteristics. Full City is a very well balanced roast level for this coffee. The body will be medium and nicely rounded. The fruit tones are dark-red berry and the acidity subtle, yet bright with a nice red wine-like finish. This roast level will bring out the a more semi-sweet chocolate experience, with notes of plum, and dark cherry. The body will be a bit deeper and the acidity tempered. I can't really recommend the darker roasts for Maui Mokka as they will completely eclipse the qualities that make this such a wonderful coffee. 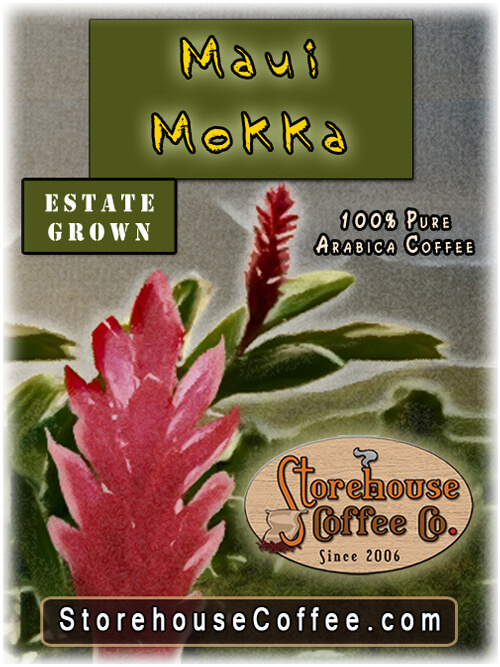 The seed stock for the Maui Mokka originated in Ethiopia and retains several of its Northern African physical characteristics - narrow leaves and small beans. Elevation: 500 ? 600 ft.